We love books. They were one of the few items besides clothing (and cats) Andrew and I brought with us when we moved to Belgium. So when I heard about a place we could share our love of reading AND get free books, I had to learn more. That’s how I found myself riding a tram to Boitsfort on a chilly November evening, for my first ever meeting of the Brussels Bookswappers Club. I had roped a friend into joining me and, after a short walk from the tram stop, we found ourselves in the cosy restaurant, Le Chapelier Fou. We followed the sounds of multilingual chatter upstairs and discovered a room full of books – my kind of place. We were greeted at the door by Karen Garside, an English expat and current president of the Brussels Bookswappers club. The club is run entirely by Karen and her band of passionate volunteers and is free for anyone to attend and swap. With over 350 members in their database, it’s a popular resource for English books in Brussels. My companion and I were surprised to find there is no complicated system for trading books. If you have some books you’d like to get rid of, you leave them on the table. If you see some books you’d like to read, you take them. It’s as easy as that. The books and members span all nationalities and linguistic groups. While the main stock of books is English, there are tables for French and Dutch books as well as offerings in Spanish, German, Italian and a variety of other languages, depending on which members attend on a given night. Children’s books are so popular, they have their own table and the club is open to all ages. The Bookswappers don’t limit themselves to printed materials either. They also swap DVDs and CDs. The Bookswappers found a permanent home at Le Chapelier Fou back in 2010 and the mutual benefit is easy to see. The restaurant offers a private room to host the book swap and storage of the books between meetings and in return it gets lots of hungry mouths to feed – including ours. Far be it for me to pass up an opportunity to try a new restaurant in Brussels. When my friend suggested we stick around for a bite, I didn’t hesitate. The hospitality was warm and friendly (even gladly catering to my friend’s special dietary restrictions). We were even treated to live piano music as we dined. The menu is quite traditional Belgian fare (with a few dishes from the Balkans thrown in for good measure) and the portion sizes were hearty. I enjoyed a special of venison steak with vegetables and potato croquettes and my companion had scampi and perfectly cooked Belgian frites. It was fun to hear so many different languages and accents mingling in the restaurant and the bookswapping room upstairs. If you’d like to get in on the Bookswapping fun and pick up some great free books, the Christmas edition of the Brussels Bookswappers will take place on the 12th of December. 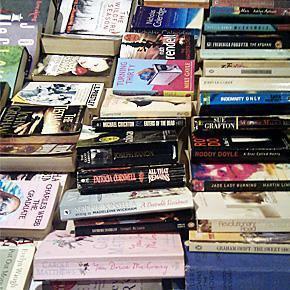 Bookswapping typically takes place between 19:00-21:30. As of yet, they don’t have a website, but you can get more information on their Facebook Page, or email them at brusselsbookswappersclub@gmail.com.